I might as well get this out of the way now, since every other review of Tap the Magic Tree by Christie Matheson has done the same: there are distinct similarities between the amazing Press Here by Hervé Tullet that came out in March of 2011 and was reviewed here shortly thereafter. Like Press Here, in Tap the Magic Tree an unseen narrator gives the reader directions to follow. This concept and the way in which Tullet brought it to life is something that I had never seen in picture books before and I think it's safe to say it was a fresh idea. It takes about two years for a picture book to go from purchased manuscript to printed book, and, unless we hear it from the author herself, we may never know if she was influenced by Tullet or if she had written this book long before his and it took her longer to sell it, which is entirely possible. More than once I have seen (and heard stories from other authors) two books with the same, seemingly unique, theme cross paths. 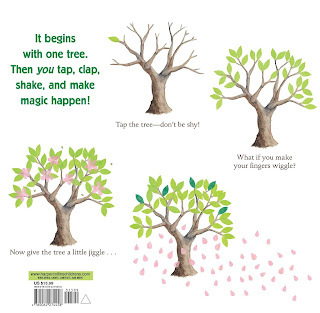 In Tap the Magic Tree, tapping, clapping, wiggling, blowing and shaking take an apple tree and the reader through the seasons, all in rhyming verse. A bare tree on a white background begins the rhyme, with delicate collage leaves, buds, apples, snowflakes and birds being added to the tree as the seasons progress. 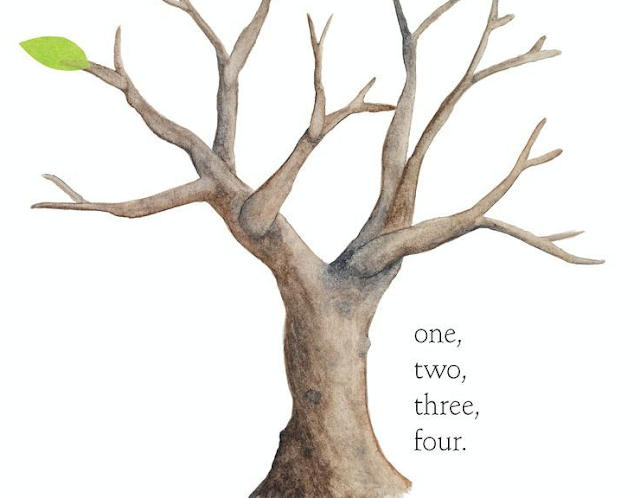 The artwork in Tap the Magic Tree is simplistic and lovely, the text equally so. After shapes and colors, numbers and letters, the seasons seems to be something that we instinctively turn to when teaching our children. Tap the Magic Tree is a nice addition to this tradition. Imitation or not, this is definitely a book that little listeners will love to hear over and over. To see Tap the Magic Tree in action, check out the book trailer below!